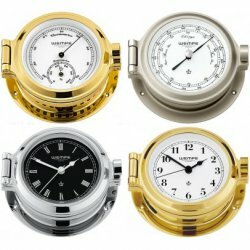 The WEMPE NAUTIC Series includes a porthole clock, a barometer, a comfortmeter, and a combined thermometer and hygrometer. All instruments are ready for order in various models that differ in type of housing. Customers have the choice between colourlessly lacquered and polished brass, highly polished chrome, and matt nickel plated. All marine instruments of the WEMPE NAUTIC Series with chrome plated housing, besides the comfortmeter, have different clock face designs and are available with in black with white numerals also. The porthole clock is offered in eight editions with numerals in Roman as well as Arabian style. The WEMPE NAUTIC instruments have a diameter of 120mm and close with a practical toggle clasp. This way, the housing can be opened even when built in or hung up to switch batteries and to adjust. Choose high-quality nautical craftsmanship from Germany - value retention included. It is always a good gift for passionate sailors.